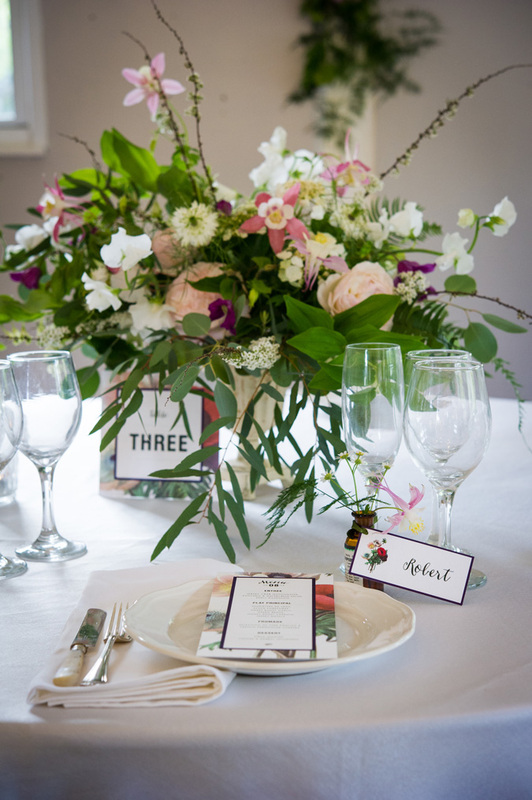 Inspiring the creative brides, this botanical styled shoot draws inspiration from the surrounding English gardens, with navy and pink running throughout. 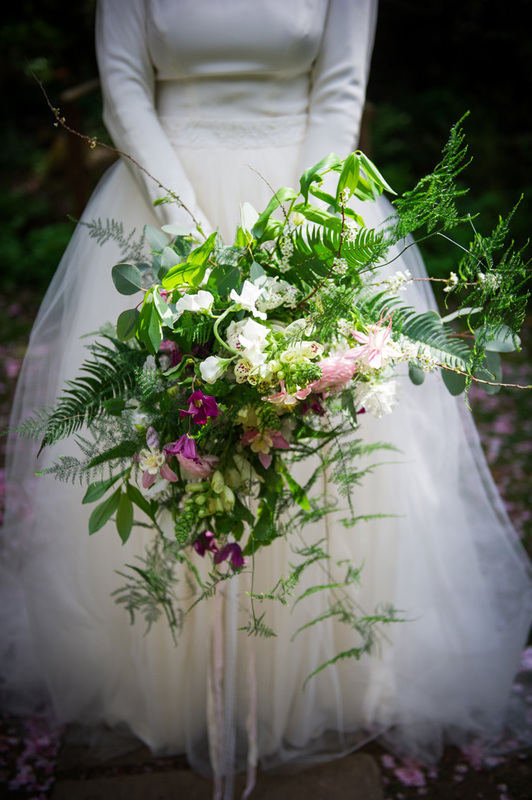 Inspired by the award-winning gardens that surround Groombridge Place, the venue for this ‘beautiful botanical’ wedding styled shoot, Creative Brides created its concept with gorgeous layered florals and foliage mimicking the different gardens at the venue. 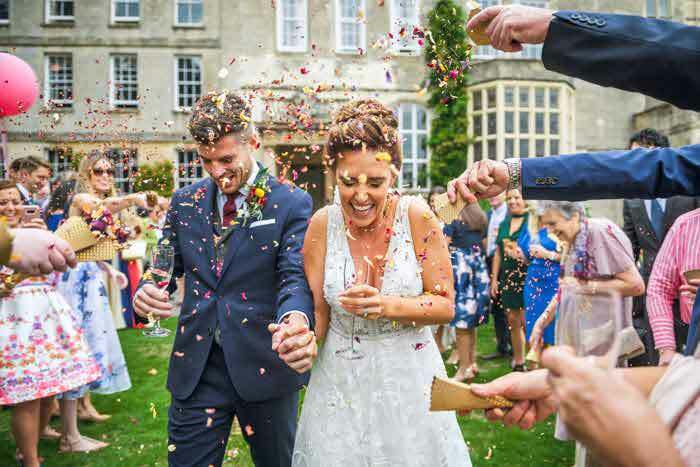 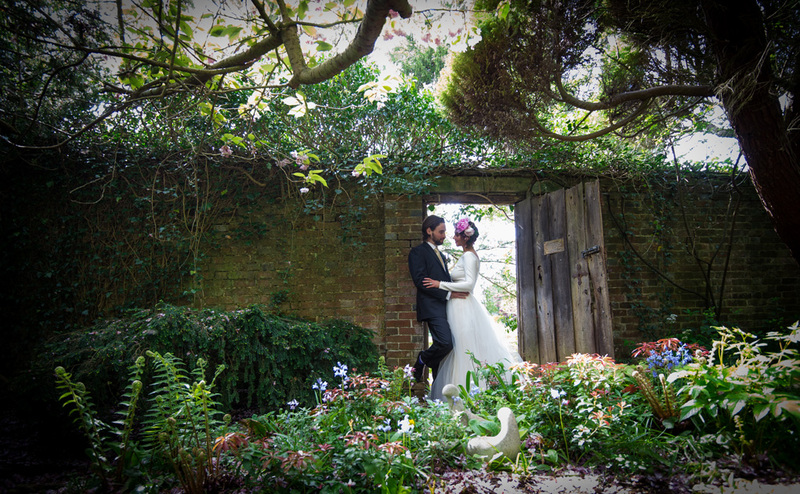 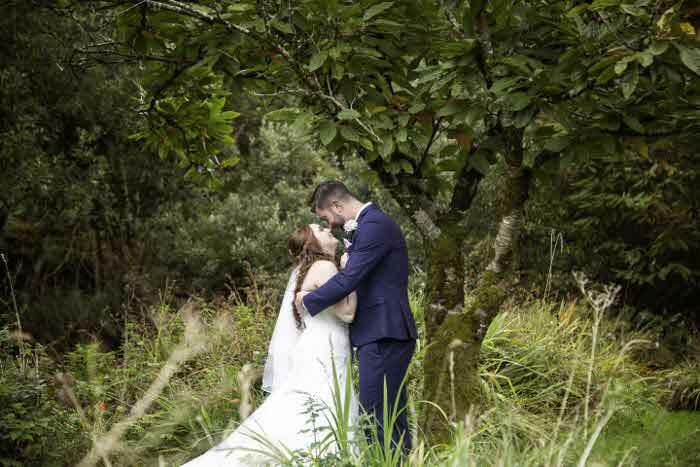 Benefiting from the breathtaking grounds, the shoot embraced the natural backdrops of the walled gardens and the enchanting giant trees that greet visitors. 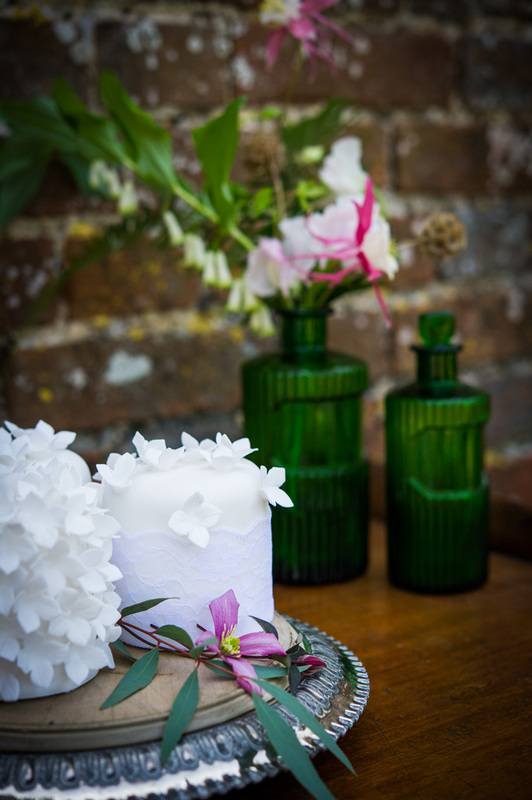 Celebrating the organic luxe of botanicals they combined the textures of the florals with brickwork and rustic woods to help show the softness of the delicate flowers. 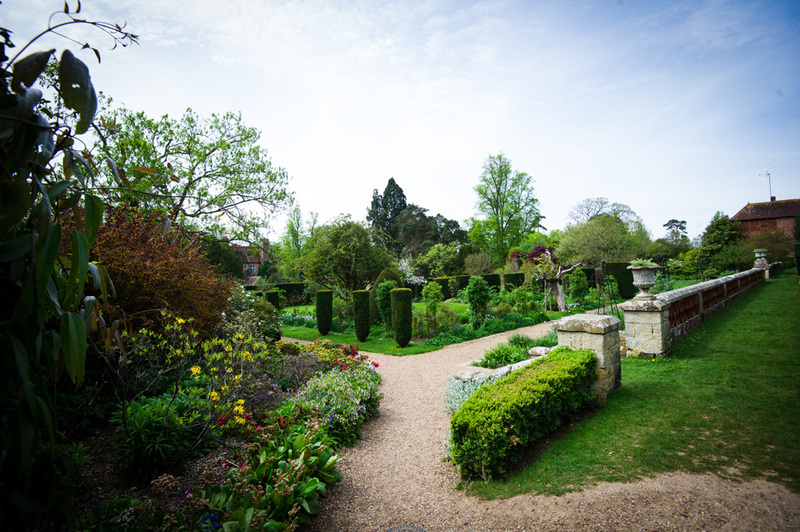 They used the features of the different parts of the gardens, from a rustic bridge to a framed wooden doorway reminiscent of ‘The Secret Garden’. 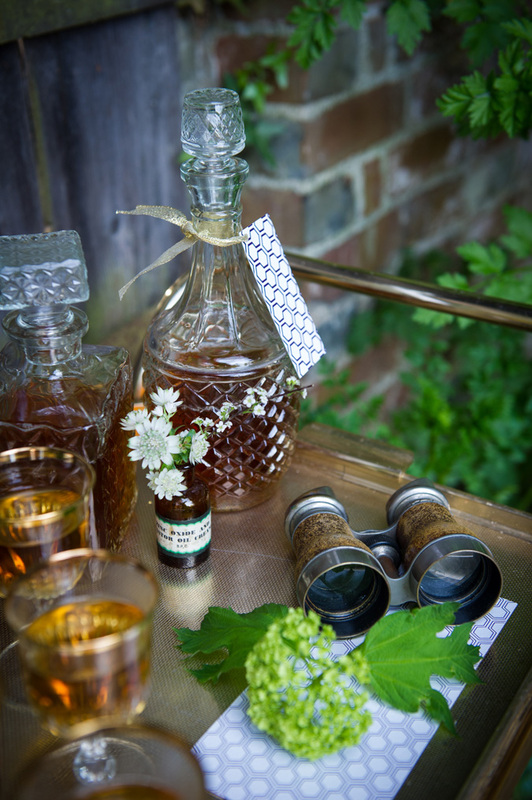 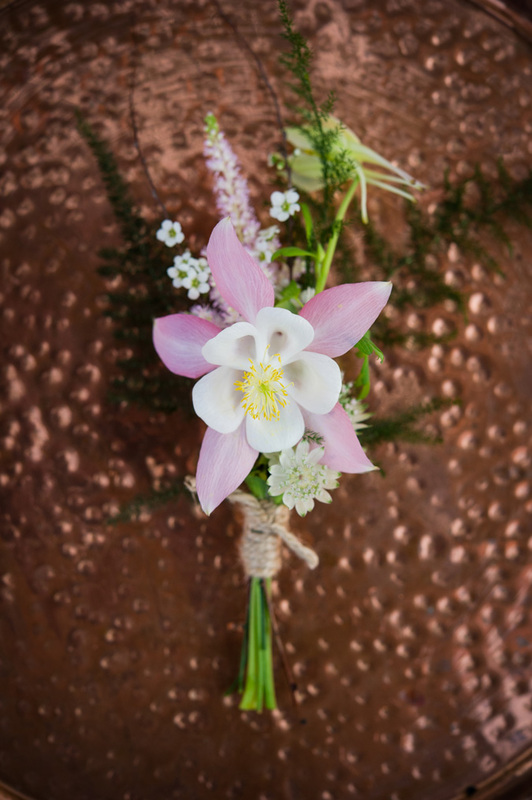 The use of new and antique props like the delicate medicine bottles used as table decorations to the copper cages which were perfect for hanging floral installations. 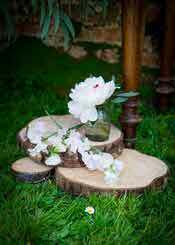 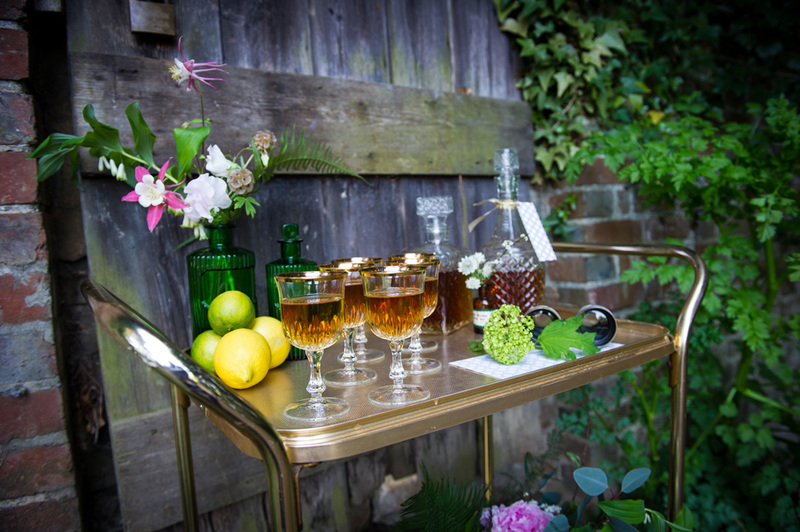 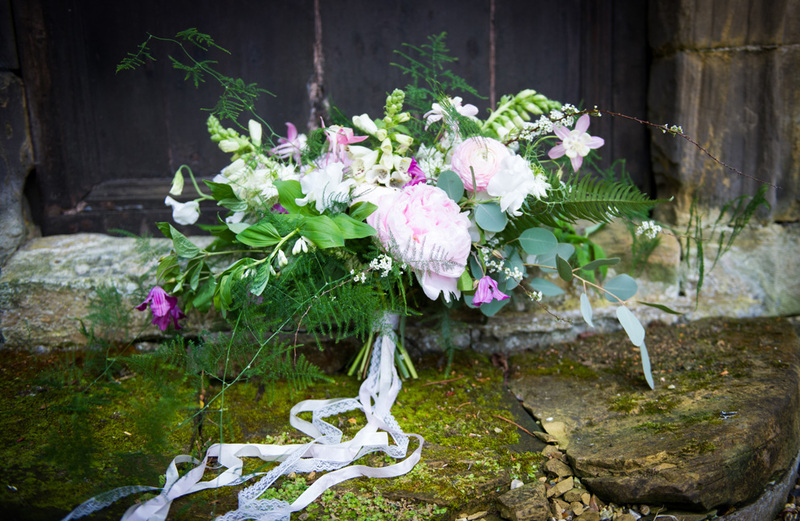 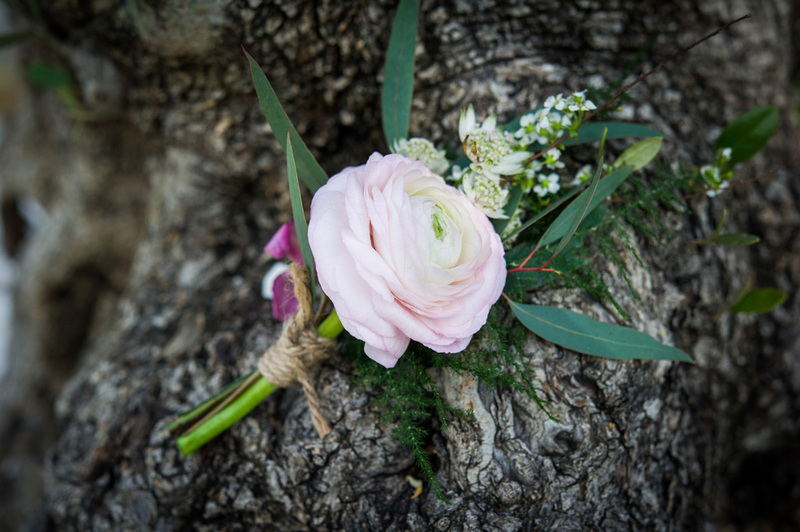 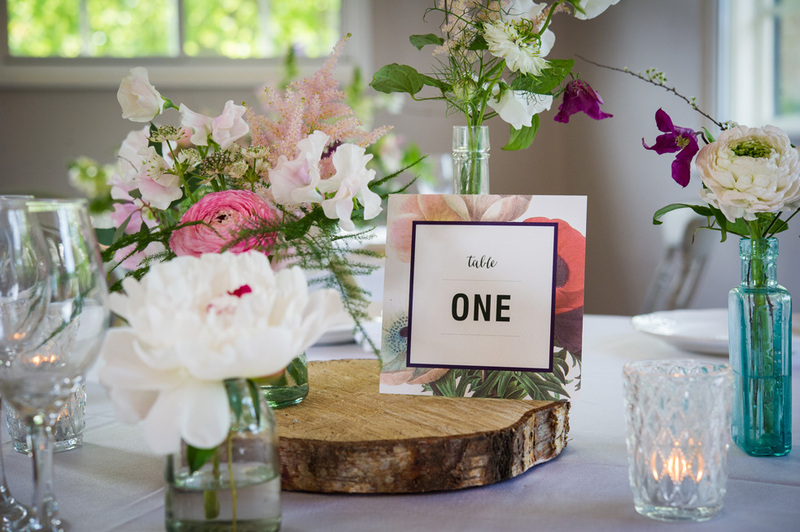 Soft peonies, pretty sweet peas, botanical ferns were gathered artistically by Florist in the Forest to create fragrant bouquets used throughout the day from table tops to the drinks station. 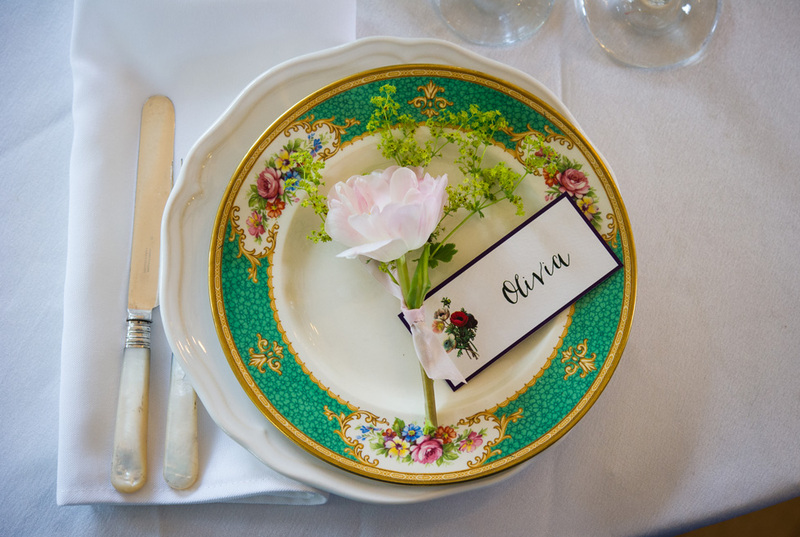 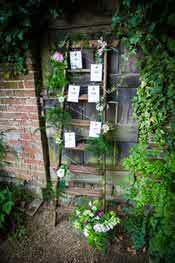 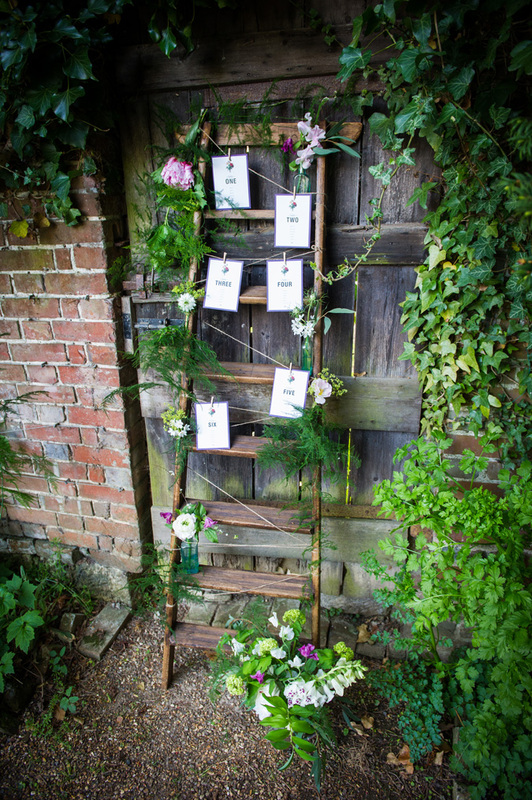 These flowers and foliage adorned the wooden ladder table plan to create a weave of botanic beauty. The pinks and whites of the flowers were contrasted with the greens of the foliage for a contemporary take on botanicals. 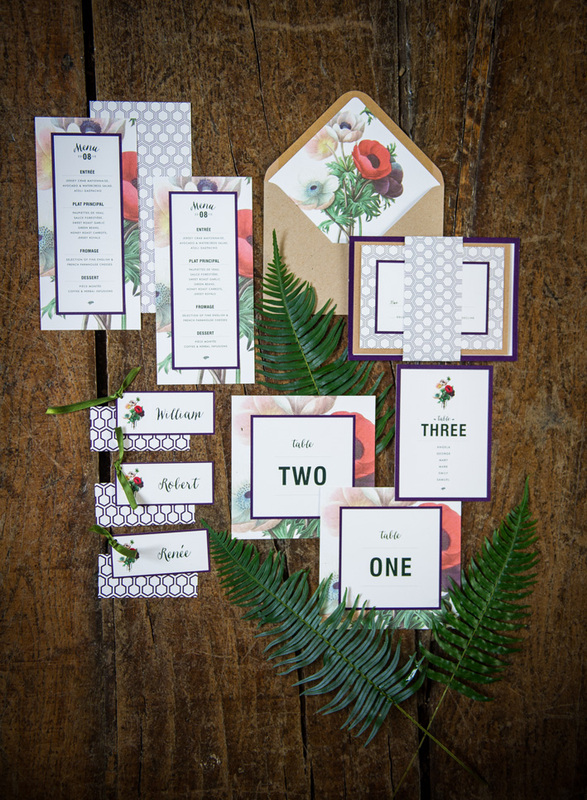 Reinforcing the botanical theme the stationery designed by A Four Letter Word incorporated a floral based design that bordered the menus and was used as an envelope insert. 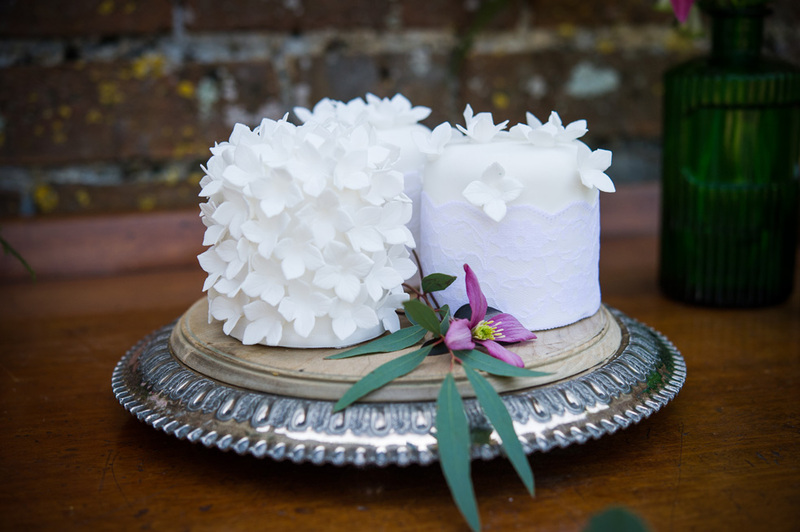 To modernise and contrast the flower imagery the backs showed a navy honeycomb pattern. 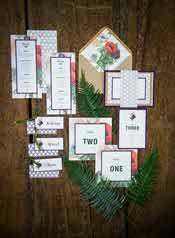 The navy colour was continued onto all of the stationary either in the font or the backing border. 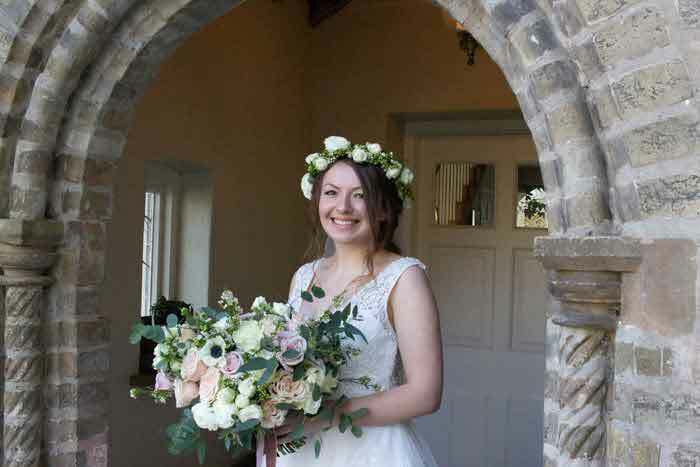 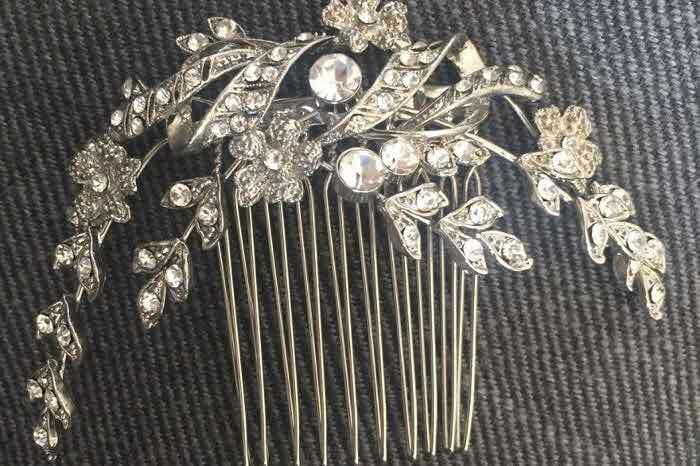 The bride’s hair was beautifully styled by Simply Beautiful WeddingHair. To complement the botanical theme fresh flowers were intertwined into the whimsical up do. 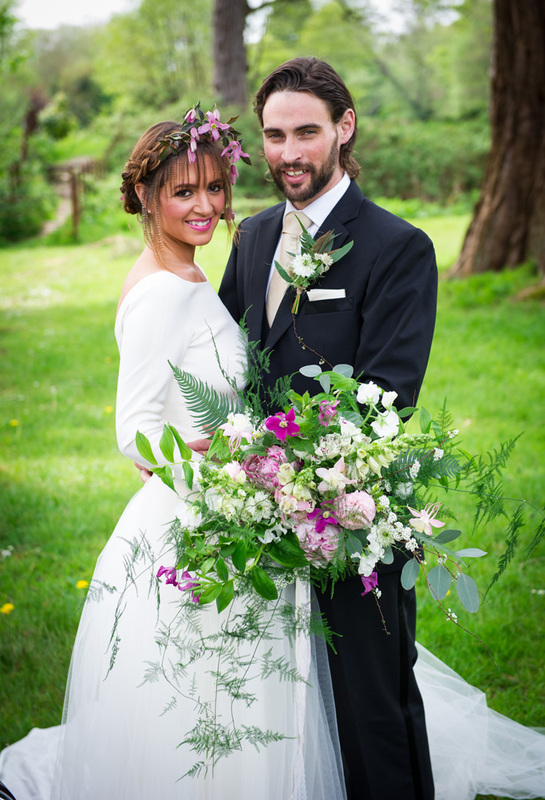 Make-up was by HarrietRainbow Make-up who subtly applied neutral eye make-up to suit the organic style of the day. 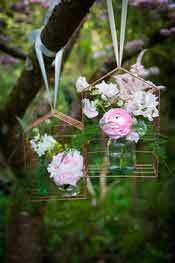 A pop of colour was added with the ‘pinch’ pink lip colour that matched the delicate pink flowers. 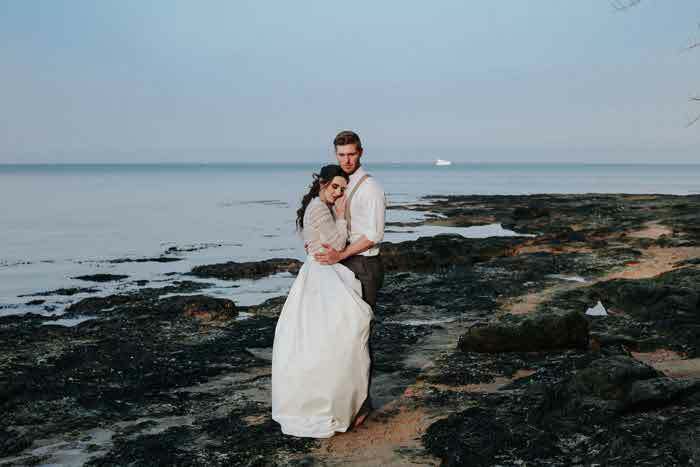 The bride wore an Elizabeth Stuart ‘Rosemary’ dress from Froufrou Bridal. 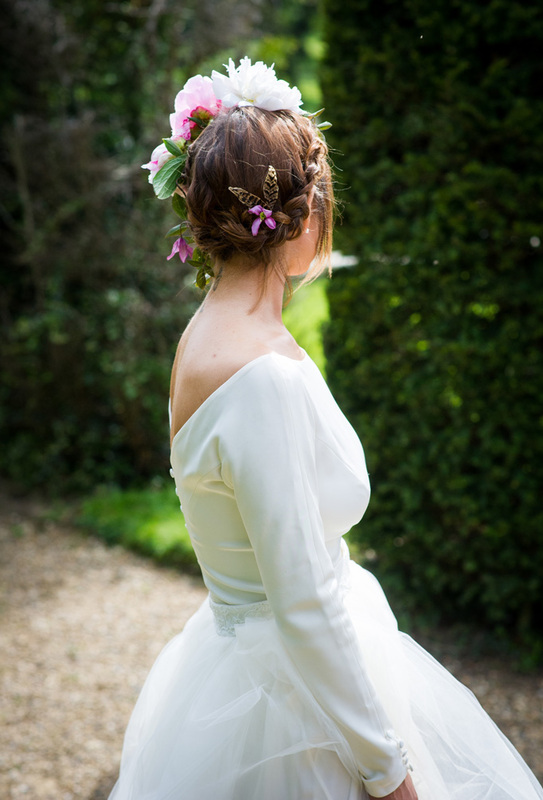 The dress itself was a flattering shape that created a romantic and soft silhouette that flowed in the wind. The skirt was made from elegant tulle fabric that flowed dreamily from the waist. This dress enhanced the simple organic romance of the wedding shoot. 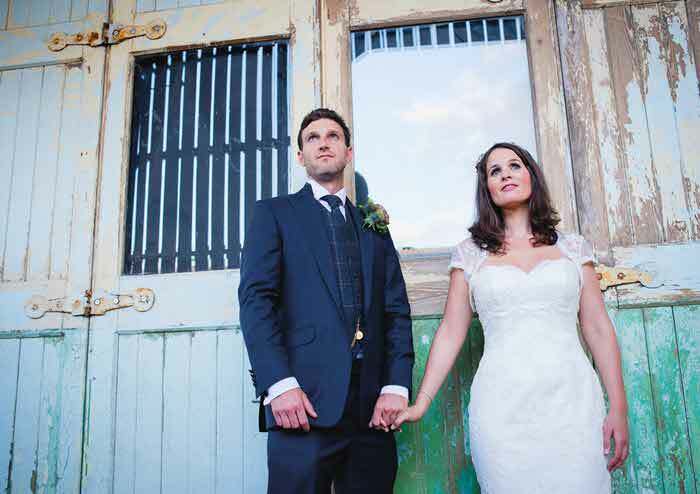 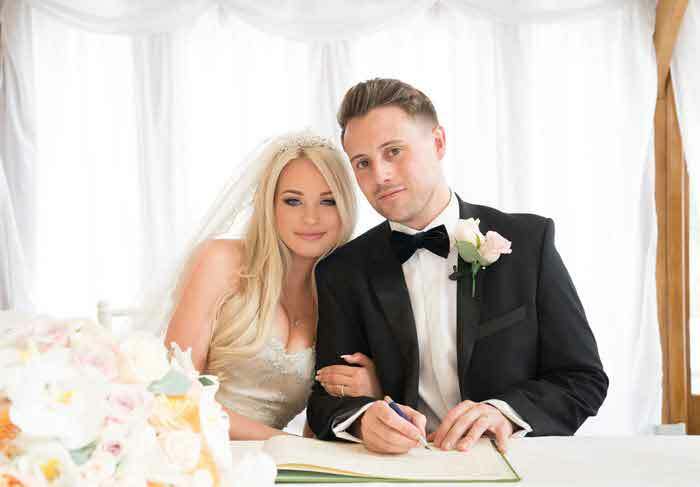 The groom’s suit was by Hardmanand Heming, tailored perfectly to add a classic style to the theme. 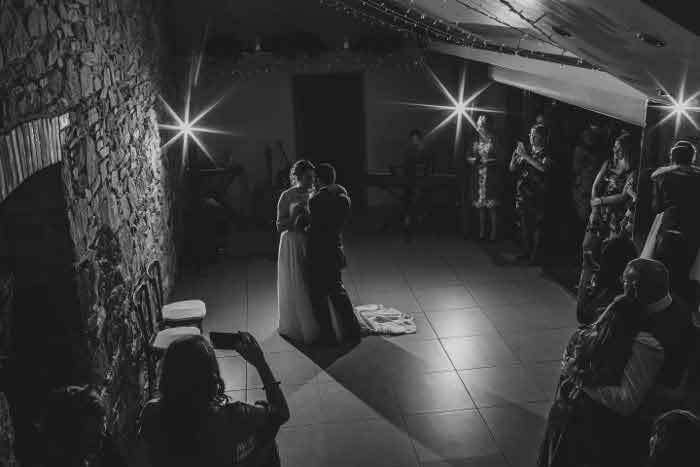 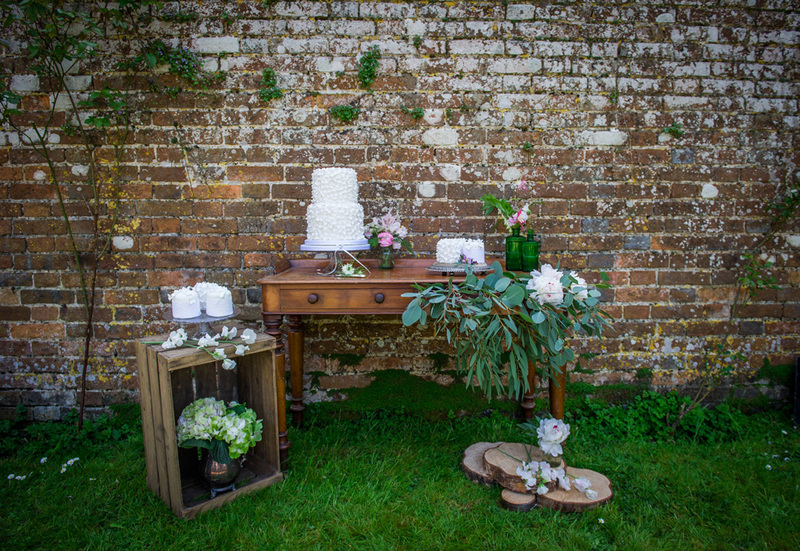 With a rustic brick wall overgrown with touches of climbing foliage acting as a background, in the foreground on a vintage wooden dressing table the gorgeous cakes created by Purple Flour were positioned pride of place. The cakes ranged in sizes and were a botanical, modern masterpiece. 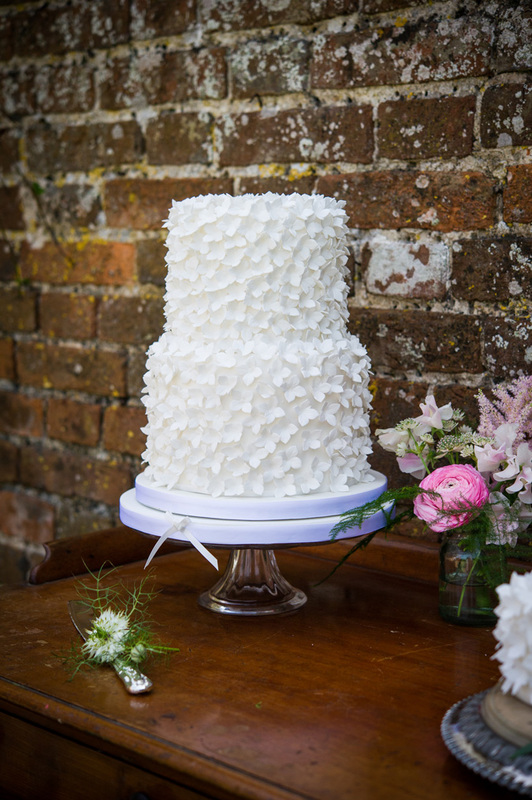 The white icing took the form of hydrangea petals adding texture and floral shapes. 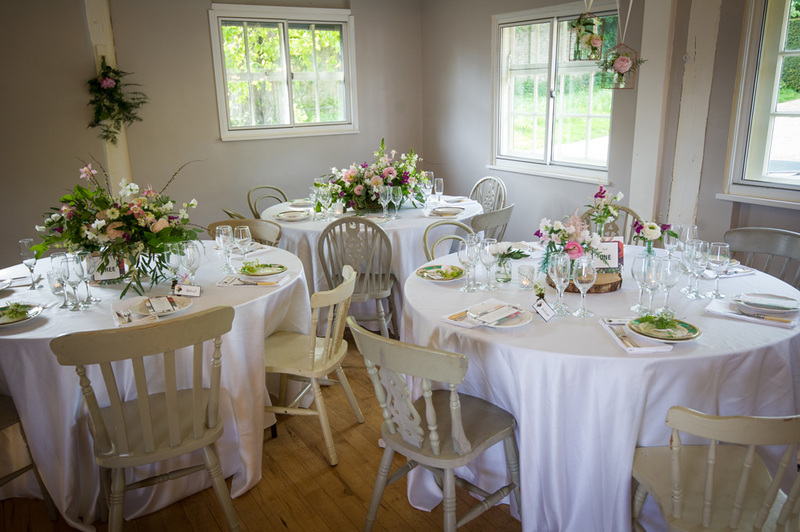 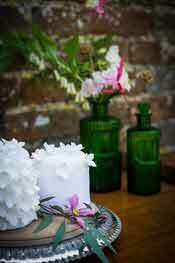 To add colour fresh flowers were lovingly draped around the table. 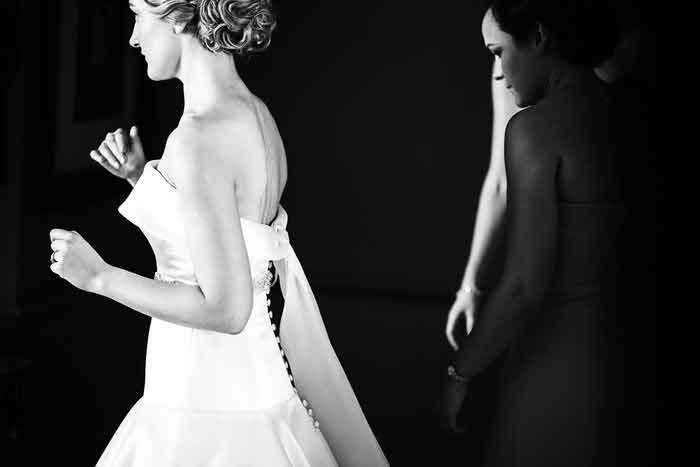 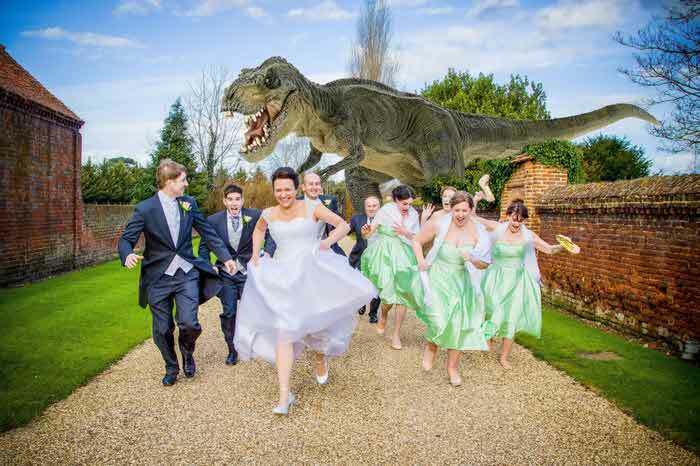 The photographer, James Grist, specialises in creative, relaxed documentary photography. 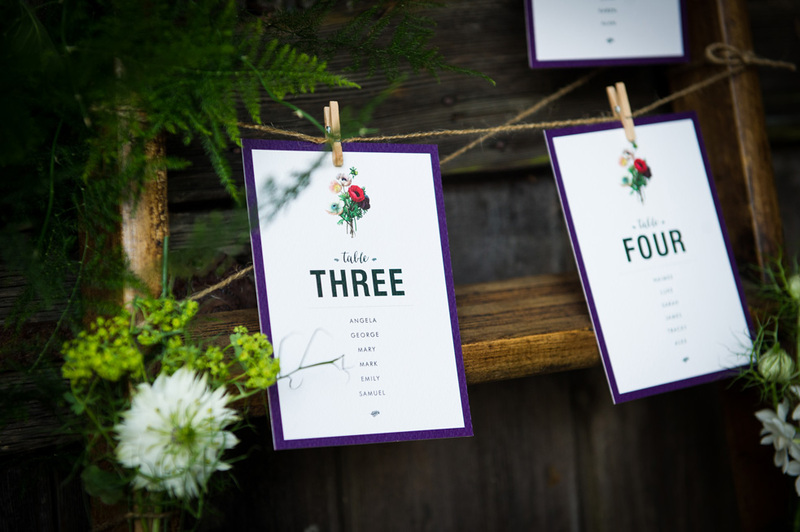 This style suited the theme as his approach captured the details in a non-obtrusive way. 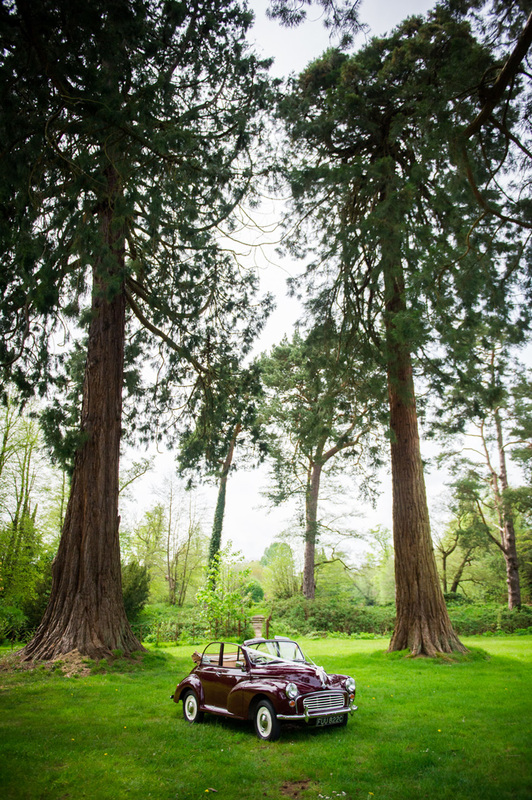 Paladin’s Classic Car Hire provided an amazing open-top Morris Minor. 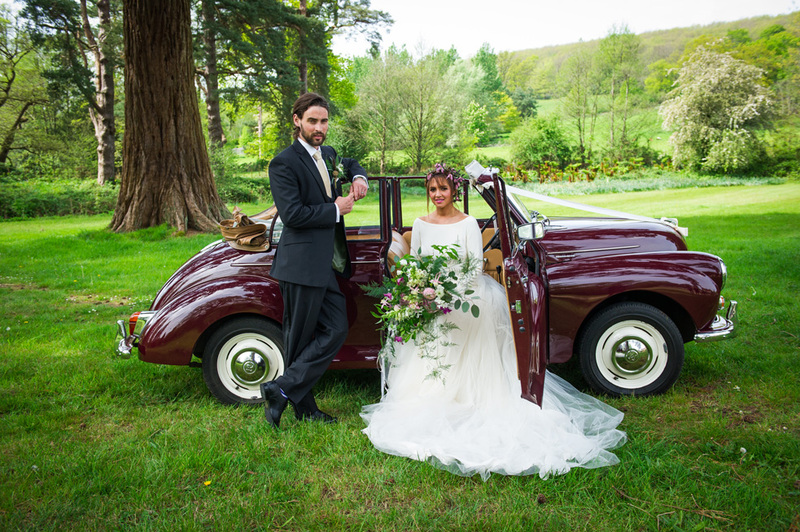 The car added some glamour to the shoot in a subtle vintage way. 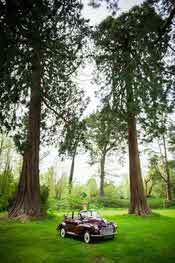 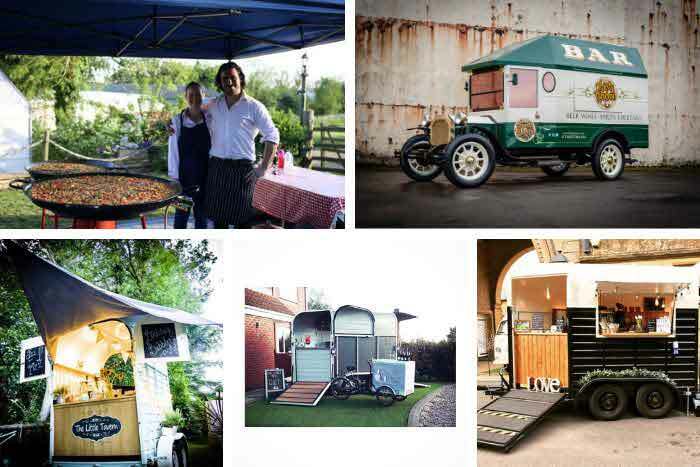 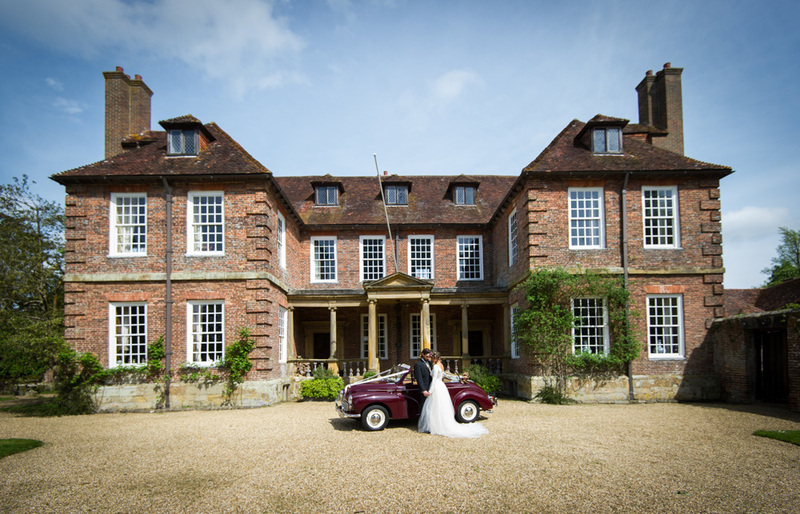 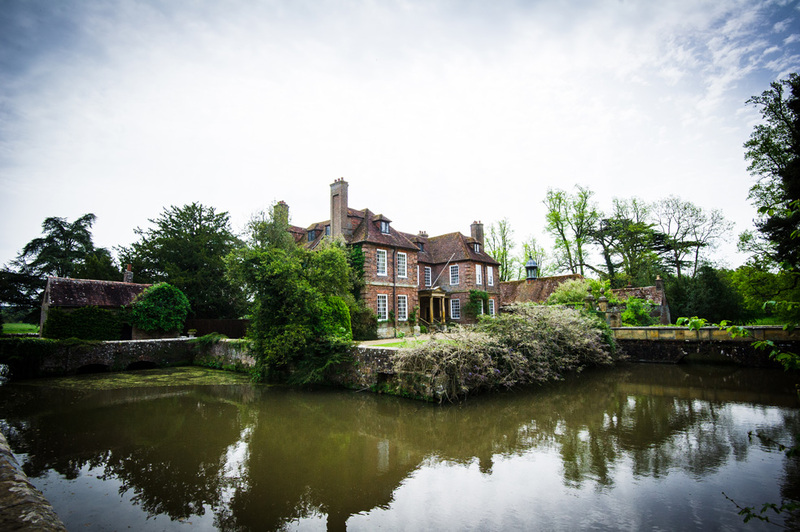 It looked beautiful in amongst the tree backdrop and suited Groombridge Place’s period drama atmosphere.